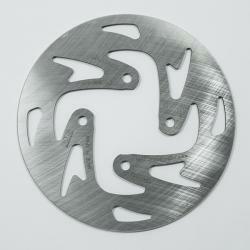 A pattern rear disc brake made by NG Brakes in Spain. This is suitable for all GasGas trials models from 2003 onwards, Jotagas from 2012 onwards, and the Sherco trials models from 2002 onwards. Available in either a 'standard' version or a slightly more expensive 'racing' version. The first photo is the standard version, the second is the more wavy racing version. Please choose your preferred one from the dropdown. Founded in 1969 in Barcelona, NG Brakes is the largest OEM Motorcycle Disc Brake manufacturer in Spain, and is known primarily as an OEM supplier to companies such as Yamaha and Honda. Uncompromising in its production, every disc that carries the NG name is made of the highest quality European steel to TÜV standards. NG Brake Discs are manufactured in Spain and sold in over 35 countries. Made of 100% 420 stainless German steel. TÜV certified and exceeds all EU, USA DOT requirements. Heat treated, laser cut and CNC machined for precise finish. Designed to ensure maximum strength & braking capabilities. 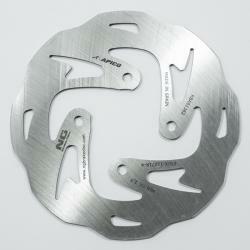 Brake disc ventilation technology provides heat dissipation and lightness.